Rare N of 4th Craftsman Heritage "C" 1912 Vintage home on 2 strata lots. 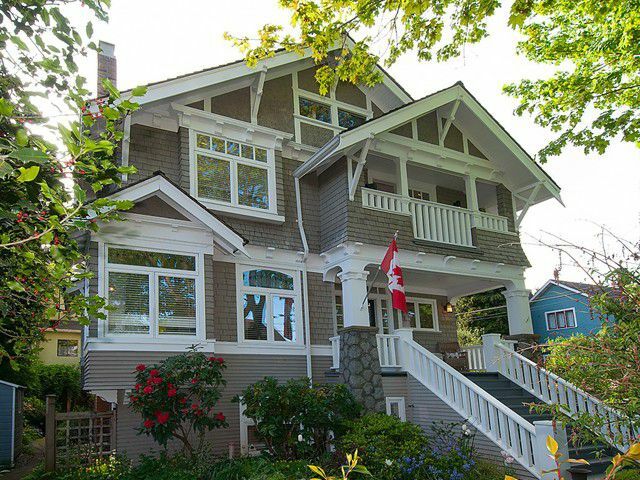 Substantial reno in Classic style incorp Old World charm w/modern convenience. Lg foyer & open design, wide plank White Oak Hrdwd flrs on main. Bright window seat, stained glass windows, wainscoting & custom millwork. Chef kitchen w/Wolfe dual fuel stove, SS appl & honed marble counters, priv sundeck & powder rm. Upper flr has 3 bdrms, master ensuite & full bath(w/in-floor heat) laundry, porch & access to lg attic w/storage. Sep legal grdn-lvl 2 bdrm/1 bath accom w/laundry & gas fp. Studio-style garage w/sink, granite counters & heated slate flr. Natural light & open outlook, landscaped & wrap-around patios. Walk to Beaches, shops & restaurants.